To meet today’s complex and ever-changing business demands, you need a solid foundation of compute, storage, networking, and software resources that is simple to deploy and can quickly and automatically adapt to changing conditions. You also need to be able to take advantage of broad expertise and proven preferred practices in systems management, applications, hardware maintenance, and more. The IBM® Flex System™ p260 and p460 Compute Nodes are IBM Power Systems™ servers optimized for virtualization, performance, and efficiency. The nodes support IBM AIX®, IBM i, or Linux operating environments, and are designed to run various workloads in IBM PureFlex™ System. 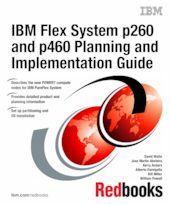 This IBM Redbooks® publication is a comprehensive guide to IBM PureFlex System and the Power Systems compute nodes. We introduce the offerings and describe the compute nodes in detail. We then describe planning and implementation steps and go through some of the key the management features of the IBM Flex System Manager management node. This book is for customers, IBM Business Partners, and IBM technical specialists that want to understand the new offerings and to plan and implement an IBM Flex System installation that involves the Power Systems compute nodes.